7th grade student Alex Huber and Coach Amy Hubbard embrace at the Charter Day School Science Olympiad award ceremony & celebration. 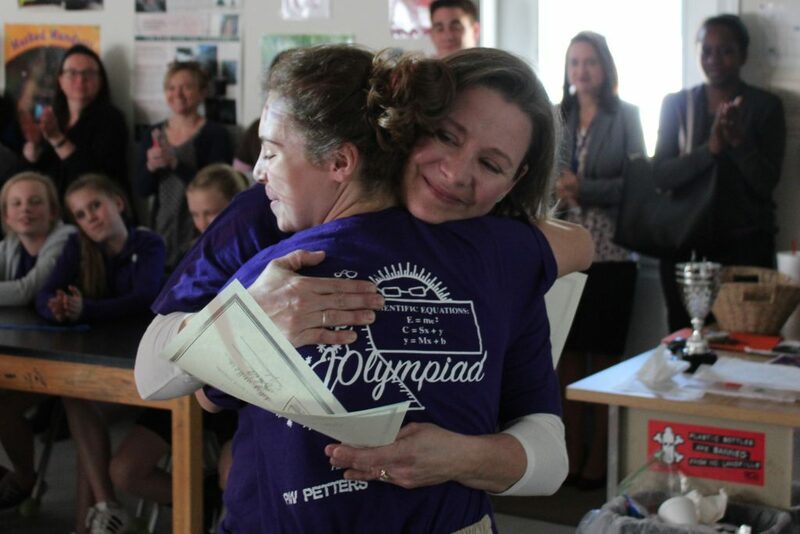 Parents, Coaches, and Students gathered in Science Olympiad Head Coach David Johnson’s classroom to celebrate their fantastic achievements at the recent Science Olympiad competition, held on March 10th. The ceremony began with a challenge to the Science Olympians to each take a wooden block, then build a structure to hold up the 10th place trophy that they receive, representing the contribution of every member of the team to the cumulative score that earned the whole team the trophy.